Ben-Zion Magal was born in 1908 inKishinev, which lies in present-day Moldavia. He completed formal study at the art academy there and in 1933 immigrated to Israel, which at that time was still called Palestine. At first he lived in Haifa. Twenty years later Magal became one of the founders of the unique artists’ village of Ein-Hod. There the artistic legacy of Magal is still looked after by his two daughters. Magal is a painter at heart and works in an expressive style characterised by powerful contours and colour planes full of contrasts, in which the depicted reality is suggested rather than realistically portrayed. His work and themes are sombre in mood when they deal with Jewish life in Eastern Europe, but they become lighter and more colourful when Magal paints the landscape of Israel. In this respect he reminds me of Vincent van Gogh, who used a completely different colour palette as soon as he started to work in Arles in the south of France. Magal renders the essence of his subject matter. His use of forms and colours is completely tailored to this end. Apart from landscapes his subjects consist of village scenes, street views, Jewish weddings and feast days, fishermen and views of the Lake ofGalilee (Kineret). Magal’s work is not specifically religious. Holy Ark is an exception. The large oil painting Holy Ark (Aron Hakodesh) dates from 1962 and measures 97 by 130 cm. One is immediately struck by the strong and warm use of colour. The dark red in the middle is enclosed by vigorous dark contours. Because of this the vertically rendered ark contrasts with the sky-blue background and our view is drawn upwards. On top of the portal two scrolls of the Torah have been placed, vaguely suggested with hardly decipherable Hebrew letters. Yet their presence and meaning are unmistakable. Exodus 25:10-22 describes in detail how the ark had to be built and ornamented. Undoubtedly Magal studied this text, but did not follow it to the letter. It is for instance not clear in the painting that the ark was made of high-quality acacia wood and moreover covered with gold leaf. The mercy seat with the cherubim is not made visible either. By means of the large size of the work and the monumental measurements of the ark Magal has wanted, however, to emphasize its impressive presence and holiness. A golden-yellow star of David can be seen in the dark red plane. The golden glow of the ark is suggested by vertical yellow stripes and vague decorations. The fine maze of extremely thin lines underscores that we as human beings should halt before the holy. They suggest a veil. At both sides of the ark we see human figures. They make clear that the ark was given to reconcile humans with God. In these figures we may recognize our mutual conversations about our Creator, but also the confrontation of single persons with their Maker, to whom we owe our lives but to whom we also need to answer. The ark after all was pre-eminently the place where the Eternal One spoke with his servant Moses, making known what he expected from the Israelites. It is this intimate place of encounter between the Holy One and his people that constitutes the essence of this painting. With very subtle means Magal has indicated powerfully this mystery. I know no other work by this artist in which he portrays the human confrontation with our Creator in a similarly disarming way. Even though he has permitted himself freedoms of expression, he has succeeded in making visible the intimate vulnerability of the holy covenant. In this expressive and colourful style of painting I am impressed most of all by Magal’s skill in making inexpressible things visible with very modest means. Perhaps it is because he suggests and hints and leaves out many things that he invites us to go and search for our own interpretation of this work. 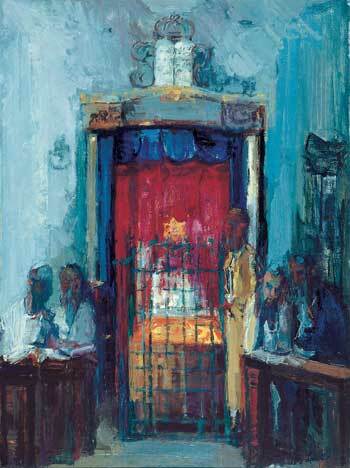 Ben-Zion Magal: Holy Ark (Aron Hakodesh),1962, oil on canvas, 97 x 130 cm. Ben-Zion Magal (1908 - 1999) ) was born in 1908 inKishinev in present-day Moldavia. He graduated from the ArtAcademy there. In 1933 he immigrated to Israel together with his wife, Chaya, an artist in her own right, and settled in Haifa. He brought with him artistic talent, experience and memories from his father's home and of the warm charm of the Jewish shtetl. However, at that time Israel wasPalestine under British Mandate (1923-1948) and impoverished culturally, without support of museums, galleries or any institutional backing. It was a very challenging environment for an artist to survive in. Ben-Zion and Chaya started literally from scratch. Together with other Haifa artists, he founded the Haifa Association of Artists. Later he was one of the first members of the Israel Association of Painters and Sculptors and was among the founders of the artistic village Ein-Hod, near Haifa. Magal's style is mainly expressionistic. The composition of the beautiful Israeli landscape, the desert and the oriental aspects are strongly expressed in the sunlight of the land. In this he follows the main trend of Israeli painters who saw, from the beginning, the landscape as one of their most important subjects. Magal's other topics deal with Jewish life and traditions in the East-European shtetl.